China sent into orbit aclandestine remote sensing satellite Wednesday during a launch that wasannounced less than a day in advance. A Long March 2C rocketblasted off at 0255 GMT Wednesday from the Taiyuan space base in northernChina's Shanxi province. The two-stage booster, propelled by a noxious mix ofhydrazine and nitrogen tetroxide, deftly guided the secret Yaogan 6 satelliteinto orbit, according to the official Xinhua news agency. Tracking data indicate therocket achieved a sun-synchronous orbit with an average altitude of about 300miles. China will use Yaogan 6 forland resource surveys, environmental surveillance, urban planning, crop yieldestimates, disaster response, and space science experiments, Xinhua reported. But Western analysts believethe spacecraft is actually a military reconnaissance satellite, possiblyoutfitted with a night-vision, cloud-piercing radar that can observe objects onthe ground during darkness and all weather conditions. The Yaogan series is likelya cover for afleet of spy satellites carrying radars and digital optical observationequipment. Yaogan satellites have beenlaunched from Taiyuan and the Jiuquan space center. 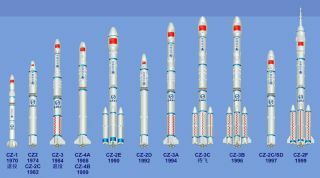 The flight was the secondspace launch of the year for China, coming eight days after the launchof a new navigation satellite.